2014 Calendars! SEASONAL RECIPES for each month with appealing photography. GOOD NEWS! Our 2014 ‘Food Is Love’ Recipe Calendars will be ready for the presses at the end of this week. Every month features a SEASONAL RECIPE with mouth-watering photography of the finished dish and serving suggestions. 11×17 inches, printed on heavy matte paper. Spiral binding & hanging loop at top. 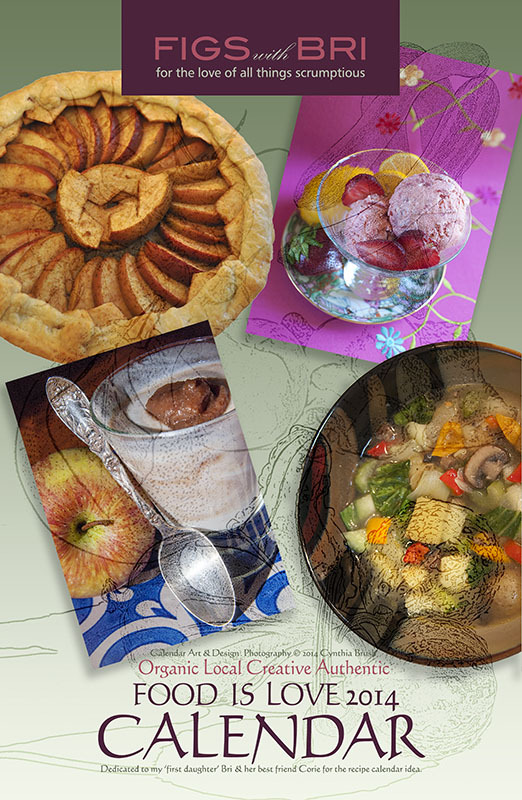 Several recipes on last year’s 2013 calendar were too long to fit in the calendar page side column (image below)….so folks had to come here to our FigsWithBri blog for the full recipe. We’ve selected shorter recipes for 2014 (our 2nd year design)…with the exception of DECEMBER, which was too detailed, so cooks will need to check FWB for the simple assembly instructions. 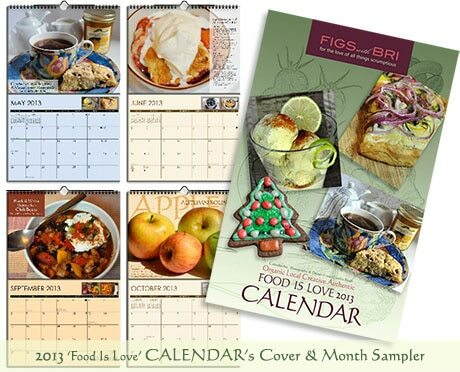 Our FigsWithBri ‘Food Is Love’ Calendars make unique, almost ‘one-of-a kind’ gifts for the upcoming winter holidays. These special, custom printed calendars are made order-by-order, not mass produced for book stores & catalogs…so you can only find them HERE. Last year folks, who bought them as gifts, said their recipients really loved them! Keep in mind, our calendars make GREAT housewarming & wedding gifts, too. 11×17 inches, printed on heavy matte paper. LOVE designing these calendars! If I can find the time, we may do a specialty produce 2014 calendar as well.